“A Christmas Carol” returns to the fabulous Fox Theatre from December 9 – 12. 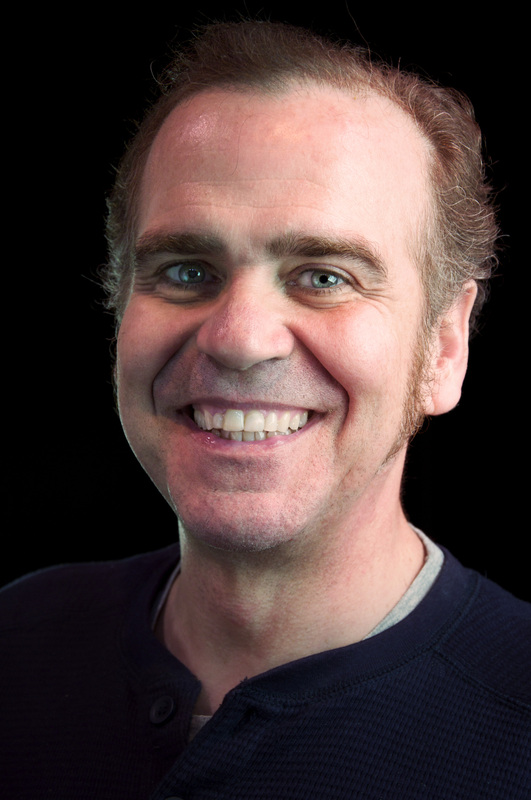 Paul Thomas Kerr has appeared throughout the country in national tours of Pirates of Penzance, Can-Can, Pajama Game, Tintypes, and 1776, and Nebraska Theatre Caravan’s A Christmas Carol as Christmas Present. Regional credits include director and actor at Cornwell’s Theatre, Derby Dinner Playhouse, Prather’s Dutch Apple Theatre, and Artist in Residence at Elon University. Last year, Paul played Ebenezer Scrooge during the Nebraska Theatre Caravan’s annual tour of “A Christmas Carol,” and is reprising the role once again. I had the chance to speak with Paul about the show, and why he is happy to be back as Scrooge once again. 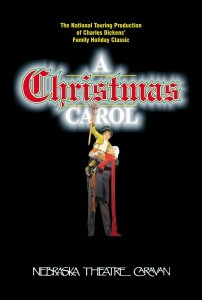 Kevin: I’m looking forward to seeing “A Christmas Carol” when it comes through St. Louis. K: Great. So you played the Fox Theatre last year during the tour? P: Yes, I certainly did. And wow, what a beautiful venue. We get to play a lot of beautiful theaters, but the Fox is just kind of the standard by which you judge a lot of other theaters. Because it is just such an amazing venue. K: Thank you. So when you were growing up, did you know you wanted to be a professional actor? P: My first professional production was in 1974, and I have been doing it ever since. Professionally, pretty much since 1979. I’ve done all facets of theater. I’ve done a lot of musicals, a lot of straight shows and Shakespeare. I’ve taught, and I’ve worked in regional theaters and dinner theaters. I’ve been guest artist at several colleges and universities around the country. I even did Christmas once on a dinner train – sang songs on a dinner train. So I’ve pretty much done every facet of theater that I can think of. I’ve done 6 or 7 national tours also. 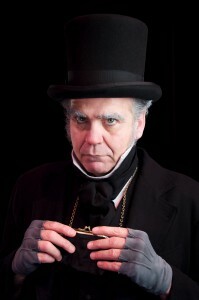 It’s certainly a privilege to be a part of this production, and to play such an amazing character as Ebenezer Scrooge. P: They’ve been doing “A Christmas Carol” on tour for about 30 years. There’s an East Coast tour that they send out, and then there’s a Midwest tour which is what we’re doing right now. We’ll be winding up in Albuquerque, New Mexico on the 23rd of December. They’ve been around about 30 years. I think it’s the largest community playhouse in the country. There are going to be other touring groups as well. The company is based in Omaha. People will remember that Henry Fonda came from Omaha. In fact, Henry Fonda’s mother performed at the playhouse and Marlon Brando also came from Omaha. And Tennessee Williams came from St. Louis. So there is a lot of great theater that came out of the Mid-west. So I’m very proud; I’m originally from Michigan, so it’s kind of neat for me to do the Mid-west tour. Back in 2006 was my first connection with Nebraska Theater Caravan. I played Christmas Present on the East Coast. So last year I was given the chance to do Scrooge in the Mid-west, and then I’m back this year. I’m real pleased to be traveling around the Mid-west. K: So how did you land the role as The Ghost of Christmas Present? P: Well, I know a lot of actors who have been a part of this production and we heard that they had openings. My fiancé and I actually sent them a tape. I had already gotten another contract, but they used her. Then we were both in the production in 2006. She actually asked me once if I would ever want to play Scrooge, and I wasn’t sure. The producers contacted me a couple of years ago, after I had done Christmas Present, and they said that they were asking six actors to send in a videotape. So they e-mailed me some sides, which are lines of dialogue, and then my fiancé read the lines to me off camera. I did a little bit of Scrooge, sent it in, and they asked me to do it. It was an amazing experience last year, and it is certainly proving to be an amazing experience again this year. It’s just such an amazing character. I think one of the great things about Scrooge is that it’s a character – as in all great stories – I think people see themselves in him. Because here’s a guy who has alienated his family, alienated his friends, alienated his employees. And who among us hasn’t felt that at one time or another. Felt alienated from ourselves, our lives. Certainly not to the extent that Ebenezer Scrooge has, but I think we all kind of see ourselves in that. We would like to be back in touch with our family; we would like to be back in touch with our friends. And we get to see him redeemed on-stage. So I think that’s also a great thing that is kind of a wish fulfillment for people. When they see him get back together with Fred, his nephew, and Millie – Fred’s wife. It’s a real interesting story. What Dickens does, which sort of pre-dates Freud, is Christmas Past is sort of a psycho-analyst. Where someone gets on the couch and starts talking about their childhood. Here, Christmas Past actually shows him his childhood, and where things went wrong. It’s kind of like a forerunner of psycho-analysis. K: It really is a neat story. It seems to be something that almost everyone looks forward to seeing every year in one version or another. P: It’s kind of humbling too, when you realize that you’re a part of peoples’ Christmas tradition. And certainly for a lot of families coming to see “A Christmas Carol,” it’s part of their tradition. So it’s a little bit humbling that you’re the one their coming to see. The production is wonderful. And I think that sense of responsibility goes through the whole cast and crew. We feel that this isn’t just another musical. This isn’t just another show. This is a very special show, and I think that sense of responsibility goes through everybody and shows in the performances. K: Were you a fan of the work before you landed the roles as Christmas Past and Ebenezer Scrooge? P: Yeah. When I was a kid, one of the first times that I ever remember seeing “A Christmas Carol” was the Mr. Magoo version. And I thought, “wow, this is pretty good.” And then I saw a movie version of it, and another movie version. And pretty soon, I think I’ve seen every incarnation of “A Christmas Carol” you could possibly see. The Muppets, Mickey Mouse, and certainly all the other versions. I didn’t watch it last year, because it was the first time that I was doing Scrooge. But this year I kind of caved in and watched the 1951 version with Alastair Sim, and enjoyed it immensely. I like the George C. Scott version, and Patrick Stewart, and all of those. I think that’s one of the marks of a great story – is that it can stand up to so many interpretations. Another interviewer asked me once… it was interesting… do I object to people doing a different spin on it? And I said, “no. Whatever makes it accessible to another generation is fantastic.” In fact, I was watching “Scrooged” last night on AMC, with Bill Murray, which I also enjoy a lot. Because it has all the elements in it certainly. I think it’s terrific. K: It’s amazing that the story can withstand so many versions, and it still works. You mentioned the Muppet version, which is one of my favorite versions. P: Yeah, and what’s interesting is that in the Muppet version, a lot of the Dickens language is in it. You know when Gonzo, and the other character are narrating, there is a lot of the original Dickens language included in it. K: I’m curious – do you ever find it difficult to transform into the character of Scrooge, since he is such an unhappy and unlikable person in the beginning? P: When you are approaching a character like this, you can never think you’re a bad guy. You just can’t ever think that. For me, you are putting on the makeup and all that, and it kind of takes over a little bit. But he’s doing his job. And he has a line, “If he be like to die, he had better do it, and decrease the surplus population.” And that was actually part of the social thought at the time. It was really thought amongst social scientists at the time, like natural selection. If you can’t keep up, and can’t pay your way and die, it’s so that other people can live. So it’s like thinning the heard. That’s just life, and that’s just the way it is. If you can’t make money, you go to the poor house. You can’t make enough to eat – you die. Because God meant it to be. What Dickens did in his stories, with “Oliver Twist” and “Copperfield” and other stories, is he said, “no, this isn’t the way it should be. You’re wrong.” And so he wrote a character like Scrooge because Scrooge was reflecting just a lot of thought in the 1840s in England. And they had debtors prison; they had work houses for kids. That was just the social mores of the time. And Dickens said, “no,” this is not right. So we see Scrooge as being mean at the beginning. But what he was really doing is reflecting the standard thought of the time of businessmen. K: So when you are in character, it is no problem. I’m sure, especially after so many performances. Not necessarily even that he is a bad person, but just to get yourself into that sort of mood and to be grumpy seems like it might be a challenge when you’re having a good day. P: The other thing you can’t discount is that there are other people on-stage. And these are marvelous actors – like Mark Edmondson, playing Bob Cratchit. You’re on-stage and you look into each other’s eyes and say, “OK. These are high stakes we’re playing right now.” You know, he’s trying to feed his family, and it’s interaction with the other actors too that helps me. It’s not a one-man show. I think the real star of the show is the story. As I said, everyone is so great in the cast. We have 4 musicians in the pit, which just add to the atmosphere of the show. Todd Olsen, our music director, is marvelous. There is such great atmosphere with the music. There are just so many elements that enter into it. It’s colorful; it’s not a musical per say, but there are songs in the show. There are dances, at Fred and Millie’s and a big dance number at Fezziwig’s. It’s fun, and it’s colorful. It gets dark when it’s supposed to get dark. But it’s a bright, colorful wonderful show. This is something I say to actors as students, and this goes the same for people coming to see the show. Why would someone pay $500 to go to a football game and sit in row Z, and look down on the field when they can stay at home with a beer or soda, and their feet up, and watch that play from 5 angles in slow motion? Why would anyone want to do that? And the answer is, because they’re there. They are there, and that’s something that CGI, movies, and videos can never do. Put the person in the same place that the event is happening. Not to get too esoteric, but one character that always gets left out is the audience. The audience is another character. The audience is part of the show. We can’t do this without the audience. And so I just love it when people come to live theater. They bring their children. You look out there and see grandkids. It’s amazing to be a part of that experience. And people come to see live theater because there is no replacing that. K: I completely understand, and can definitely back up what you are saying. It’s an incredible experience to be out there in the audience, and see these shows and the wonderful actors. Everything is live, there aren’t multiple takes. I can’t give you enough credit. P: Well, it’s fun to do. It’s a real privilege. The sets are great, and all of the elements are there. And to be playing at the Fox is kind of the cherry on top of that sundae for us. And you know, anything can happen. We were at a theater two nights ago, and there was a bat flying around. Somehow a bat got in, so the Fezziwigs are singing and dancing and a bat is flying across the stage. And you know, you just deal with that. And I though to myself, I hope the bat flies by when the spirit of Christmas Future comes in. Because he’s all spooky, and 10 feet tall and there’s smoke and fog. I thought that would be really awesome if a bat flew across the stage. Anything can happen, and that’s why it’s so much fun to do. K: If you had to pick something, just a part of being a part of this particular show, what would it be? P: Boy, that’s so hard to say. I could be cliché and say I enjoy everything. I enjoy the beginning, when you setup the Scrooge character. I enjoy the end, when he’s redeemed. But I think for me, one of the parts I really enjoy is when I’m being shown things. When I’m reacting, when Christmas Past shows me Ebenezer and his sister Fan as children. And we have marvelous, marvelous kid actors in the show by the way. Their chaperone comes with them, and makes sure they do their homework and everything. But they’re just such great kids. So when Scrooge is shown himself as a child, and when he sees himself proposing to Belle, and when Belle leaves him – that’s in the first act. In the second act, Christmas Present is showing him the Cratchits celebrating Christmas and all Scrooge is doing is watching and taking this all in. And at Fred and Millie’s party, they’re playing party games, and he’s observing all of this and gets sucked into the action. I think those are my favorite parts of the show. Partly because I get to see my fellow actors doing their work – which I am so involved in that all of that stuff is just swirling around me. But getting a chance to see their work, and also the character Scrooge and getting to see all these elements in his life. Because gee, wouldn’t that be fun for us to be able to say, “look at your Christmas when you were 7 years old.” That would be an amazing thing to be able to watch. So I think those are my favorite parts of the show. K: How many performances do you do during the tour? P: We went out on Thanksgiving, and we wind up on December 23rd. We have a lot of doubles too. Probably somewhere between 40 and 50 I think. K: When you aren’t performing in “A Christmas Carol” and the tour is over, what other projects are you working on? P: Actually, I’m working on a script right now. There’s a gospel musical called “Smoke on the Mountain,” which has been around for a while. It’s about a family in North Carolina that plays instruments and sings together. And I directed that last year. And the production that I directed last year is going to Arizona and Florida, which I also direct and played the father in. But before that, I’m working on the third installment of “Smoke on the Mountain,” which I’m directing and playing the father in. I start rehearsals January 2nd in Pennsylvania. So I go to Pennsylvania, where I’m directing and playing the father in “Smoke on the Mountain: Homecoming.” Then the original in Arizona and Florida. That’s until July. Then there are other things on the burner. There’s a movie, on December the 14th. It’s actually been shown twice already. On Trinity Broadcasting Network, TBN, on December the 14th there will be a movie called “The Perfect Gift” – which I have a small role in. I think on the 23rd and 24th of December as well. I shot it last year. K: It sounds like you’re busy, and enjoy traveling around a lot. P: I’m very lucky, because I’m on tour now with my fiancé. She’s playing Nell, the wool seller, and Mrs. Crow – one of the two women who tear the bed curtains down. So we get to travel together, and we’ll be on tour together doing “Smoke on the Mountain” also. So it’s fun to be on tour with her. And kind of makes it a little easier. Performances of “A Christmas Carol” at the Fox Theatre run from December 9 – 12. For more information and to purchase tickets, visit Metrotix or the Fabulous Fox Theatre website.